(CBS/AP) Tens of thousands of protesters gathered on the streets of Cairo in a fourth day of unprecedented protests demanding an end to President Hosni Mubarak's three-decade rule. Police and demonstrators clashed as rubber bullets, teargas and water cannons were fired at protesters who hurled stones back, shouting "Down, down, Hosni Mubarak," witnesses said. Anti-government activists had promised a "Day of Wrath" on Friday after prayers and urged thousands of people to join. Police blanketed Cairo and blocked social networking communications in an effort to stifle the protests, but to no avail. 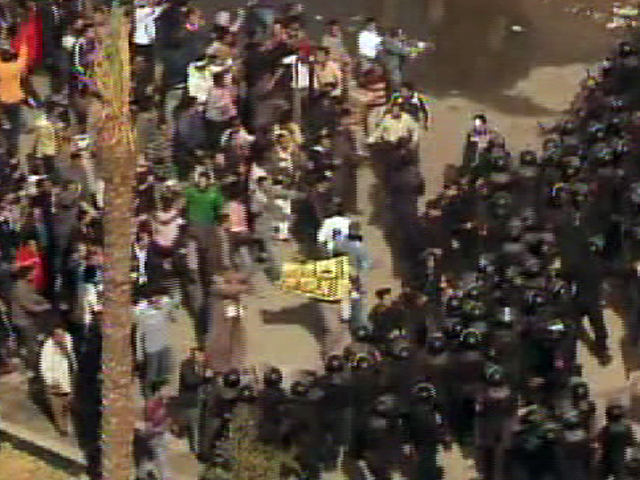 The unrest is unprecedented in Mubarak's rule in Egypt, where security services keep a tight grip on dissent. It was triggered by the overthrow two weeks ago of Tunisian President Zine al-Abidine Ben Al Ben Ali in a popular revolt which also inspired anti-government protests in Yemen and Algeria. The protesters, many of them young Egyptians embittered by unemployment, poverty, corruption and the lack of freedom under Mubarak, appear to be loosely organized with no figurehead.